At the mentioned time, the dies are taken and the measurements are made. Similarly, on the CD dimension, the stone die changed from 9.4310 to 9.5800 to 9.5930 from immediate pour to 24 h to 48 h, respectively. On comparison, silicone die changed from 9.0880 to 9.7450 to 9.5690 from immediate pour to 24 h to 48 h, respectively [Table 1] and [Table 2]. 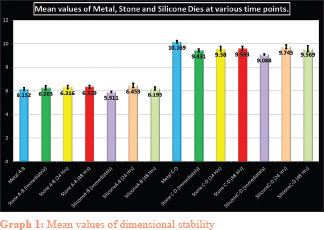 On statistically analyzing the data using paired sample t-test, the difference between the stone die and silicone die over a period was not statistically significant [Graph 1]. Boberick KG, Bachstein TK. Use of a flexible cast for the indirect fabrication of provisional restorations. J Prosthet Dent 1999;82:90-3. Chaffee NR, Bailey JH, Sherrad DJ. Dimensional accuracy of improved dental stone and epoxy die material Part-1. J Prosthet Dent 1997;77:131-5. American Dental Association specification no. : 25 for dental gypsum products. J Am Dent Assoc 1981;102:351. Winkler MM, Monaghan P, Gilbert JL, Lautenschlager EP. Comparison of four techniques for monitoring the setting kinetics of gypsum. J Prosthet Dent 1998;79:532-6. Paquette JM, Taniguchi T, White SN. Dimensional accuracy of an epoxy resin die material using two setting methods. J Prosthet Dent 2000;83:301-5. Gujjarlapudi MC, Reddy SV, Madineni PK, Ealla KK, Nunna VN, Manne SD, et al. Comparative evaluation of few physical properties of epoxy resin, resin-modified gypsum and conventional type IV gypsum die materials: An in vitro study. J Contemp Dent Pract 2012;13:48-54. Duke P, Moore BK, Haug SP, Andres CJ. Study of the physical properties of type IV gypsum, resin-containing, and epoxy die materials. J Prosthet Dent 2000;83:466-73. Rosensteil SF. Contemporary Fixed Prosthodontics. 3rd ed. Elsevier: Mosby Inc.; 2001. Gerrow JD, Price RB. Comparison of the surface detail reproduction of flexible die material systems. J Prosthet Dent 1998;80:485-9.